Congrats to my friend Lauren Wenchel at Charm City Bride who just started writing for the Baltimore Sun’s Blog: Charm City Current! Hopefully now loads of Baltimoreans will be able to check out Lauren’s fabulous, inspiring, creative blog posts! Lauren writes about all things Weddings in and around our great city. Be sure to check her out! I just finished Novella Carpenter’s new book Farm City. At first, I thought I wasn’t going to like Novella. I can’t pinpoint why. Maybe it was because a good portion of the book is about her raising and killing animals for food. (not something I’m into) Maybe it’s because after reading a lot of gardening books, the stories all start to sound the same. Maybe it’s because she only mentions flowers once (as companion plants for her veggies). But Novella’s story was different. Inspiring actually-in a quirky, non-vegetarian, west coast kind of way. Novella and her boyfriend live in Oakland California. They live in the grungy, ghetto part of Oakland. Not the upscale, fancy part of Oakland. They took over about an acre of vacant land at the end of their street where buildings used to stand and turned it into an Urban Farm. They raised food for themselves, their neighbors, homeless folks and the Black Panthers. They also raised honey bees. I never really gave much thought to bees. I mean, I understand their importance in pollination, I know they are in danger from Colony Collapse Disorder but I never really pictured what it would be like to be a bee keeper. It sounded fascinating, challenging and pretty cool-especially in the middle of the city. They also raised chickens, turkeys, rabbits and 2 pigs- for food. Right on their little vacant lot in Oakland. They also killed each of these animals themselves, except for the pigs, because they were too big. Now don’t get me wrong, I am a vegetarian. I have been for 18 years. I have no plan to change that. But I have to say, it was interesting to me to see the care and concern Novella gave to these animals before she killed them and ate them. Still not my thing, but really interesting reading. I was really excited after reading this book because I started to think of all the cool urban farming projects that Baltimore is getting into:Real Food Farm, Great Kids Farm, community gardens and a great new urban farm project coming soon to a community near you (stayed tuned for more info). This book made me miss my old stomping grounds of San Francisco, but it also reminded me that Baltimore is a great place for Urban Farming, a great place to make a difference and a great place to live. Check out these gorgeous flower arrangements in the lobby of the Beverly Hilton! And these at the Beverly Wilshire. Probably not local…but still really beautiful. I’m fortunate to work with great photographers. They always take amazing, artistic, creative photographs of our flowers and our clients with our flowers. (photo above from Wendy Hickok) (photo below by Jocelyn Mathewes) Most of them have been super generous and share the photos with us for our website, blog, Facebook and more. My problem is trying to organize and manage all of these wonderful gifts throughout the year. Not to mention, I bought a new camera myself this year, which has encouraged me to take a gazillion pictures of my own too…more to manage. In an attempt to get organized and with a goal of being able to share as many pictures of our work as possible, I started a LoCoFLo Flickr account. Flickr has turned out to be a pretty good tool. It will now hold ALL of my photos for LoCoFlo including ones I’ve taken myself and ones I’ve been gifted by photographers and clients. I will continue to “tag” them as best I can so that everyone who should get credit (farmers, photographers) gets credit and so that they are easy to search through. If you get a chance to look at them, I’d encourage you to make comments-especially if you like them! I’ve also joined the Association of Specialty Cut Flower Growers Flickr group called Real Weddings with Locally Grown Flowers. This group is full of beautiful photos from farmers and designers from all over the country that are using locally grown flowers for weddings. I am so proud to be included in this group! 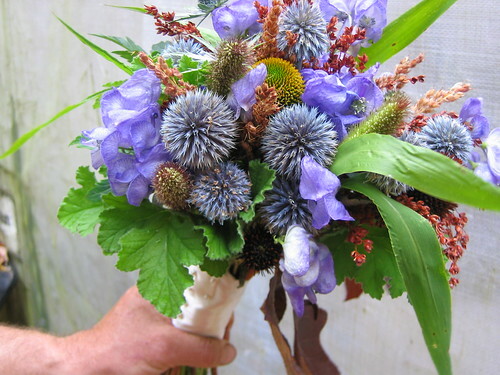 Be sure to check it out and let the growers/designers know how much you LOVE their work-like the great bouquet by Shady Grove Garden and Nursery in North Carolina. You can also see LoCoFlo pictures on our Facebook Fan Page, on this blog and on our website. For the most comprehensive collection of our pictures though, be sure to check out the new Flickr site. Whoever thought Baltimore Bride Magazine would be promoting locally grown wedding flowers? Sure enough, in the January 2010 edition, Martha Thomas has written a great article entitled Think Flowers, Act Local. It’s great to have a mainstream bridal magazine focus attention on the use of locally grown flowers and on LoCoFlo specifically! It’s really exciting to to know that Buying Local is becoming more popular than ever. There are a few things I feel like I need to clarify from the article. Fall is one of our busiest seasons. We had flowers until the first week of November this year. There are lots of flowers available in the fall (that weren’t included on the list ) such as dahlias, snapdragons, tuberose, celosia, gomphrena, salvia, mums, grasses, berries and more. Clarification blah blah blah…I am THRILLED that we made it into Baltimore Bride Magazine! I am THRILLED that brides from all over Maryland will be reading about WHY they should choose locally grown flowers for their wedding! Thanks Martha! You ROCK! Real Food Farm is going to be having a winter farm stand at the Green School (2800 Brendan Avenue, B-more21213) Thursday, January 7 between 3-6 selling delish, locally grown veggies. 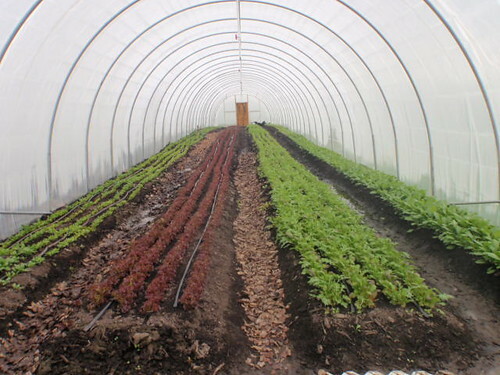 And when I say locally grown-I mean grown in a green house in Clifton Park! How cool right? They’ll have radishes, turnips, salad greens and spinach. As many of you know I’m keeping my fingers crossed that Real Food Farm and its partner Safe Healing Foundation will start growing cut flowers for sale. It would be awesome to be getting some of our flowers from INSIDE the city limits. I’ll keep you posted! So if you have time, stop by and pick up some veggies tomorrow. We have never done a wedding show before. While our primary customers are brides, we have not considered ourselves part of the conventional wedding industry. We’ve been on the periphery. A niche market. Or so we thought. Apparently, Green weddings are all the rage. Websites and blogs like the Green Bride Guide and Eco Chic Wedding are hugely popular. Baltimore Bride Magazine even did an article in their latest magazine about Buying Local. Vendors are making changes to include Green elements-some because its the right thing to do, some because Green sells. Either way, Green is HOT right now! I’ll update you more as we get closer (what will our booth look like? what kind of swag will we bring? what will be our raffle prize?) Right now, just know, LoCoFlo will be at the Mid Atlantic Green Wedding Showcase on February 21, 2010 from 1pm to 5pm at Samuel Riggs IV Alumni Center, College Park, MD. Put it on your calendar and come out and see us! To get tickets, click here! Happy New Year to all of of our family, friends and fans! 2009 was an exciting year for LoCoFlo. We worked on 22 weddings last year as well as a hand full of other great events including Flowermart and Baltimore’s 1st Annual EcoBall. We met great couples, business owners, chefs and more that are committed to using locally grown flowers in their personal lives and businesses. Like any small business we had our challenges too. Marina decided to no longer be an owner of Local Color Flowers. It was a hard decision for her-and hard on both of us for a while….but we came out better for it on the other side. Marina will still be sharing her talents with LoCoFlo as a lead designer-so watch out to see what she has in store for 2010. We will also be seeing more of designers Jen Bryant and Carla Ryon this year. Hopefully we’ll also add some new faces to the LoCoFlo team as well. As 2010 begins, I’m looking forward to a great year! To start, we had a great article come out in Baltimore Bride Magazine about LoCoFlo and about using locally grown flowers for your wedding. Before weddings begin for the year, LoCoflo will be setting up at their first ever wedding show, the Mid Atlantic Green Wedding Expo on February 21, 2010. I’ll also be doing my first arranging/speaking engagement for the 57th Annual Meeting of the District III Federated Garden Clubs of Maryland in early March. Then…weddings begin! We have so many fun weddings scheduled with great couples at beautiful locations. We’re also looking forward to building relationships with several local restaurants and businesses to provide weekly flower arrangements for them during the grown season (March-October). So Happy New Year everyone. Thank you so much for your support this past year and don’t forget to buy local this year!